Follow these tips to fall back smoothly and adjust to the new time change. Getting an extra hour of rest sounds awesome, but it also means leaving the office when it’s basically pitch black out. Adjusting to the new time change may take up to a week to get used to. It can mess with your circadian rhythm—the internal clock that controls sleep, energy, and even hunger. A 2013 study suggests that during autumn transition, people tend to get up earlier and lose time sleeping overall. Moreover, studies show a slight uptick in heart attacks to and from daylight saving time. The good news: If you follow the right strategies, you can adjust to the change in a day or less. Saturday night might seem like a great time to go out and get a couple of drinks, but you’ll feel the impact long past the hangover when the clocks shift behind. What’s another drink if you get an extra hour of sleep, right? But the truth is that while alcohol may make you feel sleepy, it actually wakes you up at night and makes it more difficult to sleep soundly. Do yourself a favor and minimize your alcohol intake. Be sure to also sip on plenty of water in between drinks. Parents of a baby can tell you that sleep schedules are important. That doesn’t change when you age. The key to waking up fresh and ready the Monday after the clocks change is a consistent sleep schedule. 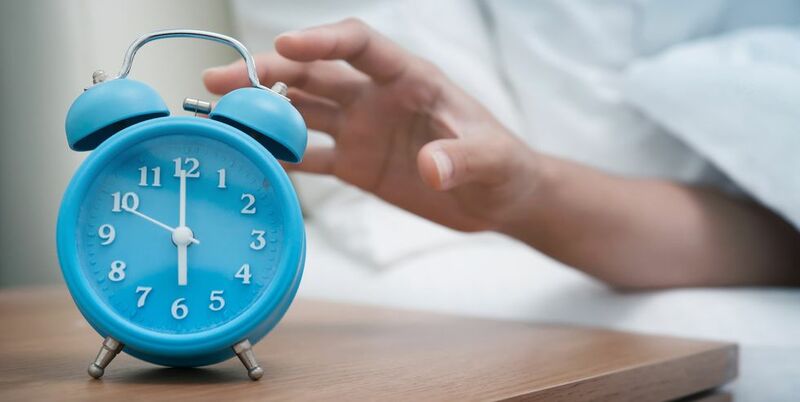 One studyfound that people who stick to a rigid schedule sleep better immediately following the time change than people who don’t—they’re also more likely to sleep better and wake up rested the rest of the year, too. Try this breathing exercise to help you fall asleep. This one seems like a no-brainer, but it’s also the most likely to be ignored. You’ll handle the time change better and be a more functional human being if you get enough sleep in the days before and following the time change. People who get up early and sleep for less than 7.5 hours a night are more likely to struggle with the time change. While there isn’t a golden amount of sleep that will leave everyone perfectly rested and energized, most people thrive on 7 to 9 hours. And don’t forget that how well you sleep is more important than how long you’re in bed or actually sleeping. We know, we just said to get more sleep and then took a glorious, alarm-free sleep catch-up off the table. But the extra sleep will only make you feel even more tired on Monday. Instead of overcoming an hour shift in your circadian rhythm, you’re now battling a larger deficit. You effectively increase the impact of the time change on the following day by sleeping later than usual. Get up at your regular time (or when you have to wake up during the workweek) to make it easier to fall asleep and sleep well on Sunday night. The jury is still out on whether taking a nap on Sunday will help you feel more alert and refreshed on Monday. A briefnap may help you catch up on lost sleep (and possibly reduce the mental anguish of having an hour rudely stolen from you). But if you’re prone to insomnia, a nap may make it even harder for you to fall asleep Sunday night. If you can’t resist, try to nap in the early afternoon, and limit it to 20-40 minutes. It’ll help you sleep better and adjust to the time change. While there is some debate over the best time to work out, consistent, frequent exercise is key. Bonus points—and potentially better sleep—if you exercise at the same time each day, which can help keep your circadian rhythm on track. Go to bed 15 minutes earlier in the four days leading up to the end of daylight saving time. By the time the clocks jumps an hour back, you’ll already be fully adjusted and ready to go. Your body’s circadian rhythm follows the light, not the numbers on the clock. Try to get outside and catch some morning and early afternoon light. If you can’t sneak out of the office, look for a bright room with natural light to get the benefits. You’ve heard it over and over, but blue and white lights from screens before bed can ruin your sleep. The parts of our brains that react to light can’t tell the difference between the bright light coming out of your phone or TV and the sun. Before you claim that putting your phone or computer into night mode means that the rule doesn’t apply to you, think again. Shutting off electronics is also about letting the brain slow down and relax. Scrolling through Facebook or watching an adrenaline-inducing (or just plain captivating) show will keep you up at night and make it even harder to adjust to the new time.